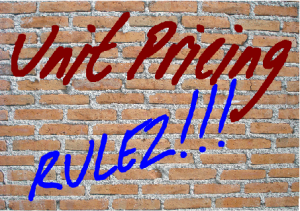 Midnight, 26 October 2012: The TCP Code’s Unit Pricing Rules are now mandatory. If you’re offering post-paid mobile plans with voice/data/SMS included $ value, or post-paid internet plans with included data, you must include certain ‘standard pricing elements’ in plan pricing info. In a nutshell, the three ‘standard pricing elements’ are the cost of a standard 2 minute mobile call, the cost of a standard SMS and the cost of a MB of data in Oz. But you don’t have to quote a unit price for any plan component that’s unlimited. Fair enough, since you can’t divide a dollar figure by infinity. Make no mistake, the Unit Pricing Rules are ACMA’s baby, and the authority will be watching websites and other advertising intently for compliance. This entry was posted in Advertising, Sales, Unit Pricing Rules and tagged advertisements, unit, unit price, unit pricing. Bookmark the permalink.